Reading the rest of this site, you might think that all the Norwich churches which have been lost were out in the industrial districts of Conesford and Pockthorpe. But another which has survived only as a name was St Mary in the Marsh, which was right in the heart of the medieval city. In fact, it was in the cathedral close, a city within a city, walled off from the rest and entered by guarded gates. 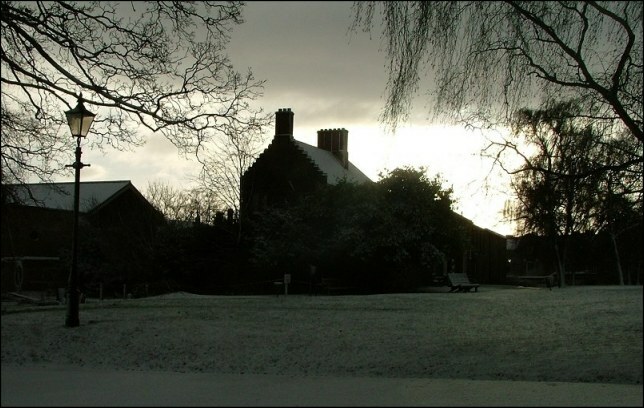 It was the parish church for the cathedral close, and was situated in the lower close, towards the river. 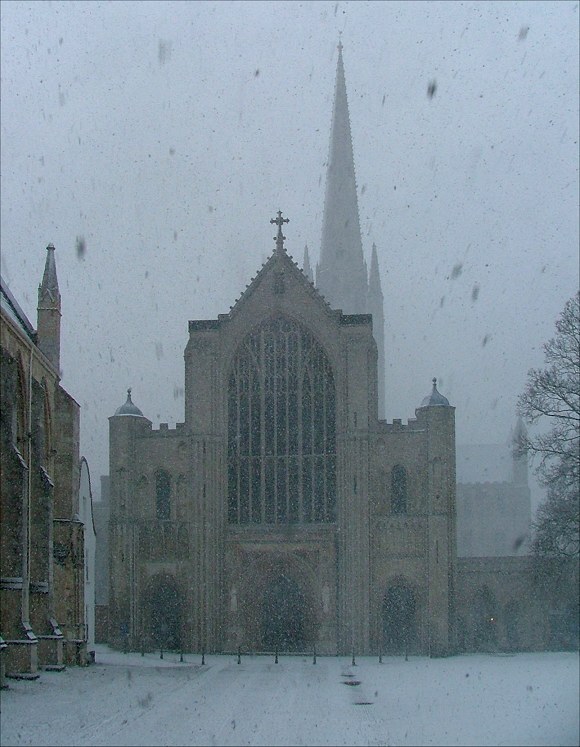 It was originally founded by Herbert Losinga, first Bishop of Norwich. He actually founded it before he became Bishop here, as an act of penance for commiting the sin of Simony. The Pope seems to have realised that Losinga was worth a bob or two, because as part of the same act of Penance he was also asked to build the great churches of St Margaret at Lynn and St Nicholas at Yarmouth, the two biggest in Norfolk. In return, the Pope let him move the See from Thetford to Norwich, which must have been so much more convenient for the football and the shops. In common with the other Norwich city churches, St Mary in the Marsh was extended and rebuilt as the centuries went by. 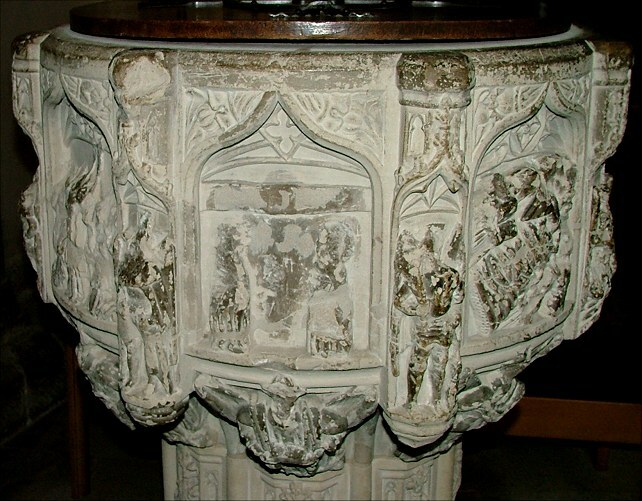 There was money being spent on it in the late 15th century, because it acquired then what we now consider to be one of the great treasures of the English medieval Church, a Seven Sacrament Font. 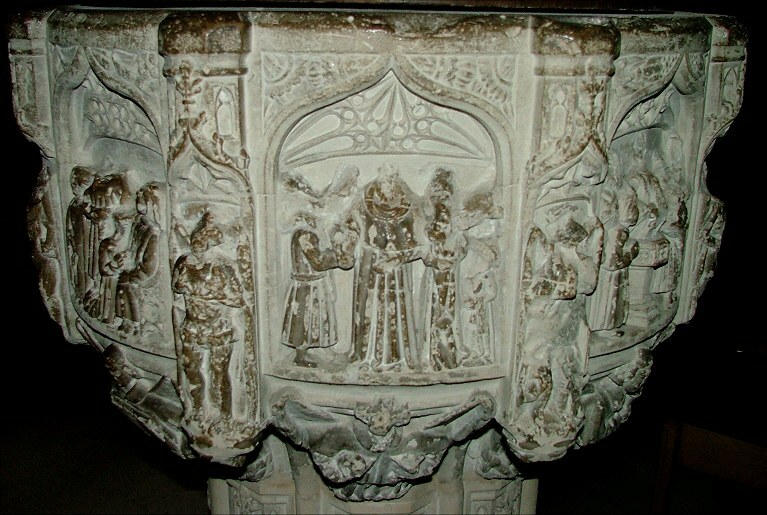 There are about thirty of these fonts surviving today, and they depict on seven of the eight sides of their bowl the seven sacraments of the Catholic church. It may seem curious to us that St Mary in the Marsh continued to thrive after Losinga built the Cathedral beside it, but the functions of a Cathedral and a parish church are quite different, and were even more so in those lost days of Catholic England. 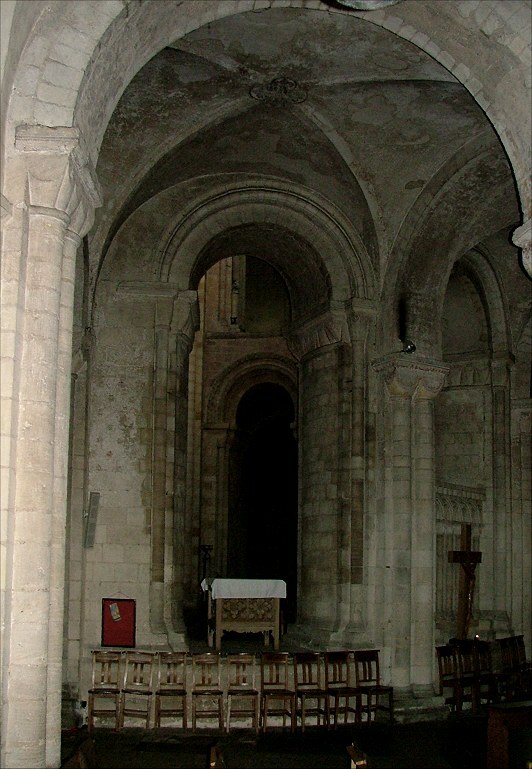 While the Cathedral was the place where the Bishop exerted his authority, the parish churches were in the business of dispensing the sacraments to those who lived in their parish. Once the Reformation came along there were fewer sacraments to dispense, but still the church marked the stages in the life of its parishioners, baptising, marrying and burying them, as well as drumming the bible into them of a Sunday. The function of a church changed at the Reformation from being largely devotional to almost wholly congregational. Devotional worship can use as many churches as it can get its hands on, because the aisles can be filled with chapels and side altars, statues and images, where people can say their prayers in private. Congregational worship doesn't need any more churches than it has people to fill them, and Norwich had no shortage of churches. Several of the city churches were obviously surplus to requirements, and St Mary in the Marsh was one of the first to go. In 1564, just six years into the reign of Elizabeth, it was pulled down, and the materials sold off. There was still the messy business of what to do with the parishioners. Redrawing parish boundaries wasn't as easy as you'd think; parishes formed areas of legal jurisdiction, and changing the boundaries had financial implications for the parishes around it. The Bishop decided on a quick fix solution - the parish of St Mary in the Marsh could use, as its parish church, one of the chapels inside the Cathedral. And so, people continued to be baptised and married in the parish of St Mary in the Marsh. 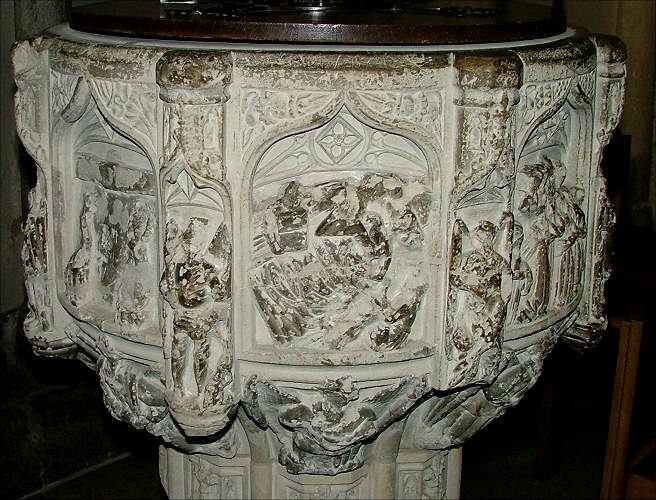 This would be no more than an interesting historical footnote, if it was not for one intriguing detail - when the Bishop gave the chapel to the parish, he let them bring their font with them. 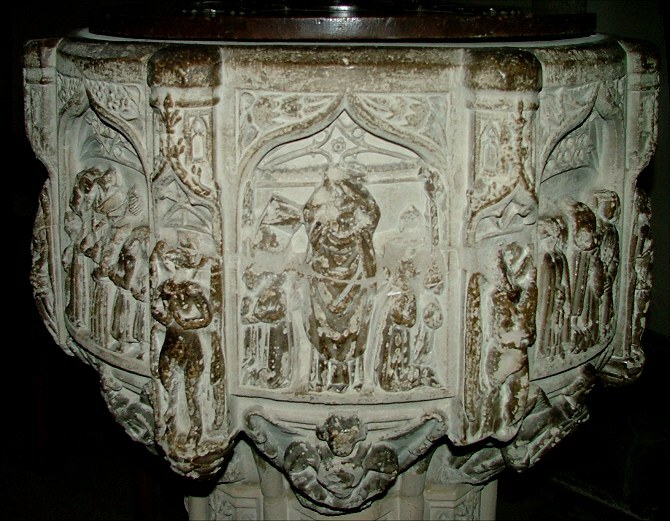 And so it survives today, still in the chapel of St Luke on the south side of the ambulatory, the 15th century font from the church of St Mary in the Marsh. As you can see below, it was a good one, but has been severely battered. 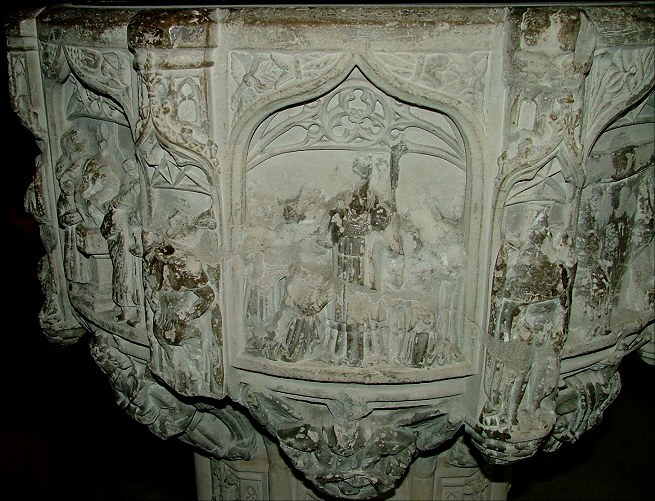 This was probably to make it flush enough to be plastered over, although the scene of the crucifixion, which forms the odd-panel-out on the eighth side, seens to have been singled out for particular vandalism. The panels show, anti-clockwise from the east, Confirmation, Mass, Confession, Matrimony, Baptism, Ordination, Crucifixion and Last RItes. St Luke's chapel is just one of several chapels radiating from the apse of the cathedral. It is very small, with room for about 30 modern chairs. 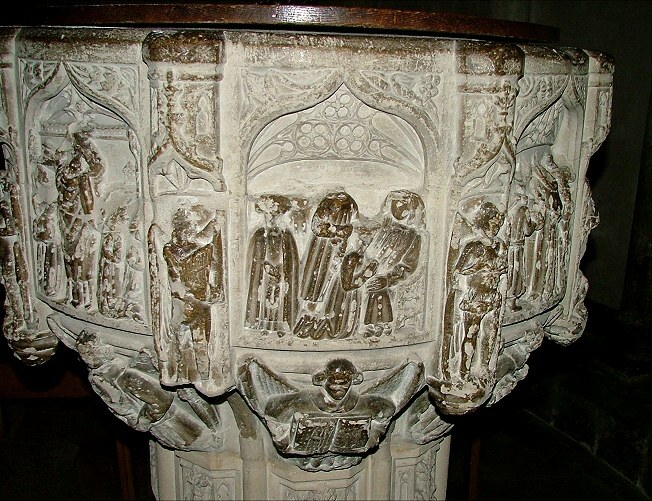 The parish still exists, its incumbency tacked onto one of the Cathedral canonries at no extra cost, and the chapel is still used today; baptisms still occasionally happen at this amazing font. 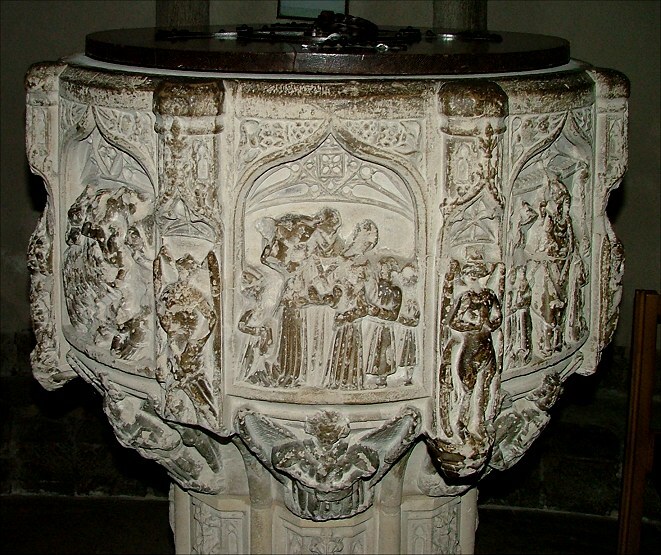 The font was joined in the chapel in 1847 by another extraordinary medieval survival. 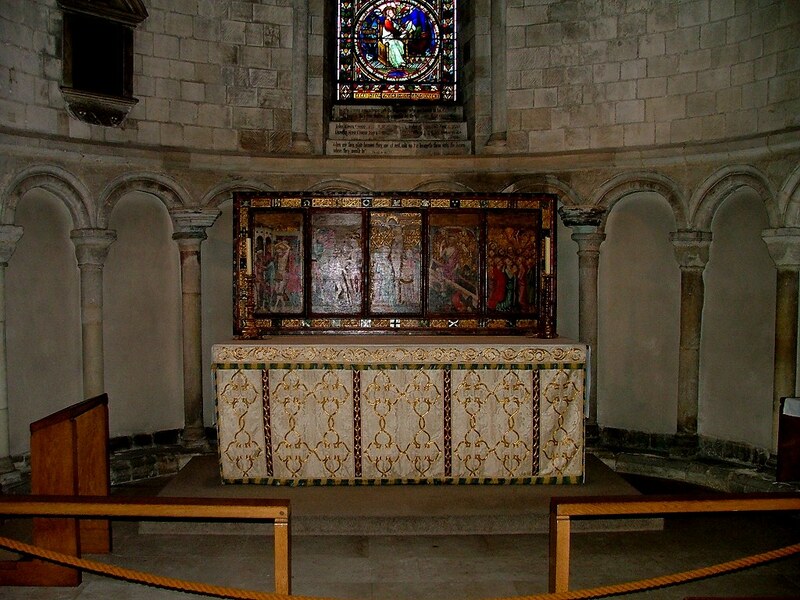 This is the Despenser retable, an altar back of the 1380s, probably given as a thanks offering for the survival of the King during the peasants revolt. 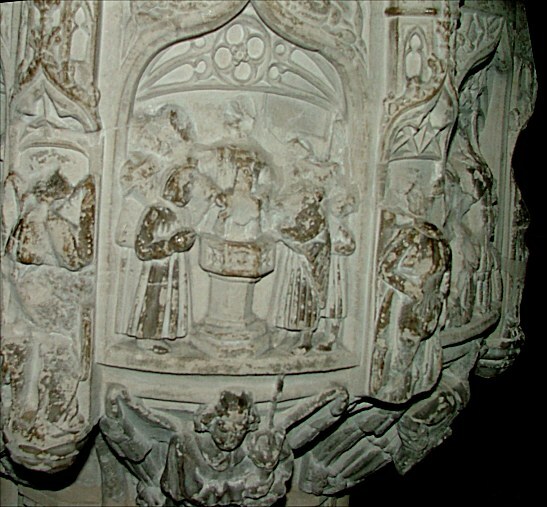 During the Reformation it had been thrown out, and was presumed destroyed; but in the early 19th century it was discovered upside down, serving as a table. Here in this tiny chapel, then, two touchstones to the past.